Are you an artist if you don’t use the “M” mode on your digital camera? If you just want to be a competent photographer I would still suggest that you stay in”M”. If you want to be the author of your images, like an artist, you should be in control of all the variables that go into creating your images. Going back to that second question….the defining characteristics of an artist; say a painter…. Has an idea for a painting (In the art of Photography Ansel Adams called this “Pre-visualization”.) This is truly the beginning of the creation of Art. Then he uses his favorite brushes (sable, synthetic, bristle, badger, squirrel, etc.,) in the many shapes made to realize his artistic vision. And finally the painter’s biggest advantage in art, over the photographer, is his control of light. In this he has god-like power to place light, in just the right amount and anywhere he wants it. This is what an ARTIST does; he is in the control of every element and tool in his creation of art. So, having started my journey as a fine-art photographer over 45 years ago (35 of those year to date as a full time professional) my only choice was using fully manual cameras. The manual mode became the most natural way for me to do photography. I had to pick each of my variables and have a reason for each choice. This image was completely planned—I already had a vision of the end result in my head; I just had to realize it on film. The subject was the famous unfinished interchange for the 101-280 freeways in San Jose, California. I had been photographing it a lot in the late 1970’s and decided to try a more ambitious night version. This was my thought process in its creation. Starting with film choice (In the film days this was always my first decision in any session) I picked EKT. H.S. 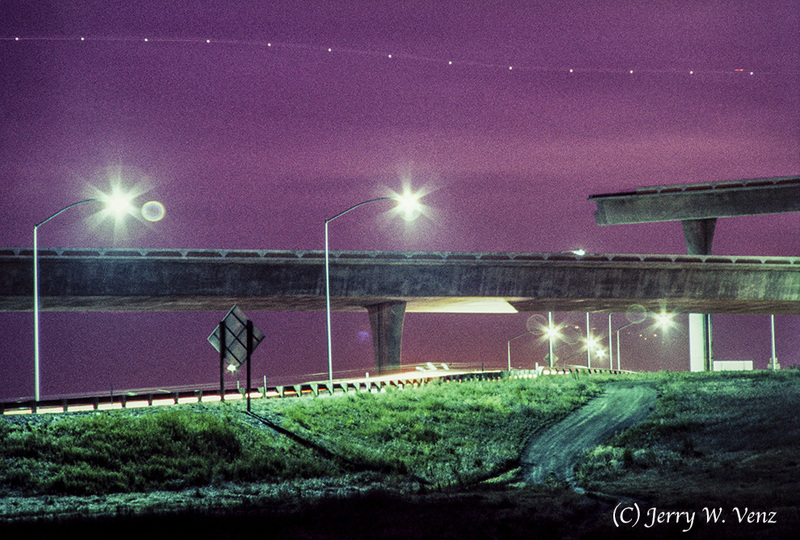 Daylight (pushing it to 1000 ASA) film to match the artificial lights along the freeway (this was back before they started using sodium vapor lights). I wanted to use a shutter speed of at least 30 seconds so the traffic on the ramp in front of me would blur and most importantly I wanted to capture the flashing warning light on any planes that entered and crossed my frame. I chose this view so the flight path of small planes landing at the nearby San Jose Airport would be visible. Focal length; I didn’t want to distort the shape of the structures, but I did want to compress the scene (back-off and set good depth-of-field) so, I chose a focal length of 200mm. I shot ONE roll of film (36 exposures) and got exactly what I wanted! The only culls were when too many cars coming towards me (headlights!) over exposed the foreground. As you can see thoughtfully controlling your variables, just like the painter does, combined with a Creative Idea, will enable you to produce more images that will be elevated from mere pictures to, dare we say, ART!